← And now there are ten…. 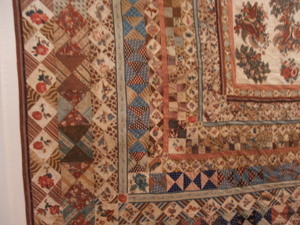 Near the end of February, I attended a quilt show/ Craft Fair in Melbourne. 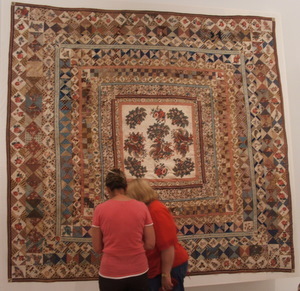 Whilst there my husband, myself and a patchwork friend Diane, went to the NGV to see this quilt that had been recently found in Central Victoria, in a damp shed. 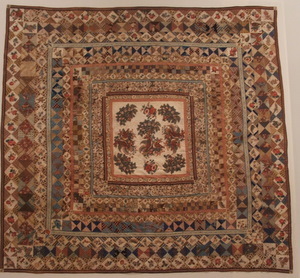 It has undergone some conservation work, and is now in the NGV collection. 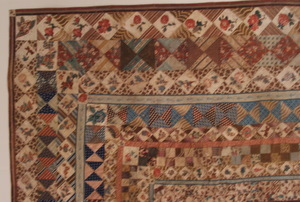 There is a little error in the text box displayed beside the quilt. 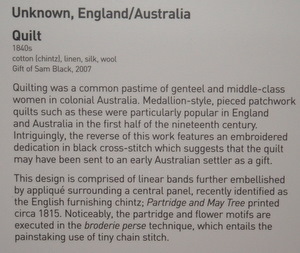 The stitching that is around every piece of broderie Perse applique is indeed Blanket stitch as you would expect, and not chain stitch as stated.